More details and registration for all three journeys HERE. Welcome. I hope this finds you well as we enter 2019. After a very full fall of teaching and travel, I’m home for a few months of quiet and deep listening. In March, I’ll be starting another yearlong course. I love these journeys because they are intimate and ongoing. There are a handful of spots left. If this calls to you, please see below for details on how to register. I’m also in the process of finishing my next book, Drinking from the River of Light: The Life of Expression, which will be out in September 2019 form Sounds True. This book gathers what I’ve learned through the years by being a student of the deeper creative process that is available to everyone, artist or not. The life of expression is how the heart breathes and how our spirit grows in the life that carries it. Writing, whatever form it takes—poetry, story, memoir, or reflection—is a personal form of expression, a necessary conversation with the Universe. And while there are many outstanding books that focus on craft and language, this book focuses on the irrepressible aspects of expression, how the forces of life enter us and leave us, and what they do to us on their way through. During the coming year, I will begin to give readings, talks, and workshops from the book, as I travel around the country teaching and speaking. I hope to see you somewhere along the way. In the meantime, many blessings to you in whatever you’re facing and whatever you’re called to. 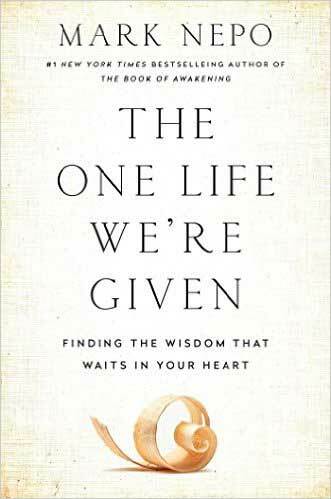 Starting in March, Mark will be leading an in-person yearlong journey for 30 students: THE ONE LIFE WE’RE GIVEN: FINDING THE WISDOM THAT WAITS IN YOUR HEART. This intimate journey will happen over four weekends in Kalamazoo. The course will take place over four weekends starting in March 2019, weaving themes from several of my books including More Together Than Alone, Things That Join the Sea and the Sky, The One Life We’re Given, and The Book of Awakening. Our aim will be to engender a live and safe space in which we can compare notes on what it means to be alive. The journey will be hosted at Peoples Church in Kalamazoo, MI. Class size is limited to 30 participants. This course is for people who are new to the yearlong journey. Registration for a continuing yearlong course will be offered for those interested in August 2019. MARK’S COMPELLING AND TIMELY EXPLORATION OF COMMUNITY, MORE TOGETHER THAN ALONE, WILL BE PUBLISHED BY ATRIA, JULY 17, AND THE UK EDITION BY RIDER BOOKS IN LONDON, JULY 5. Read more about More Together Than Alone and PREORDER today. Mark will be in Albany, NY, NYC, Southern CA, St Paul MN, Charleston SC, Albuquerque NM, Santa Cruz, Los Angeles, and San Rafael CA, and Rhinebeck, NY during the Spring and Summer of 2019. I will be offering workshops and retreats around the country and abroad, focusing on my latest books, Drinking from the River of Light, More Together Than Alone, and Things That Join the Sea and the Sky. I hope you can join me. many blessings. 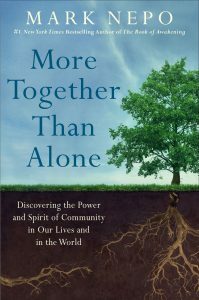 FEB 21: Western Michigan University, Bill Burian Community Lecture Series, More Together Than Alone: The Power and Spirit of Community, 2452 Knauss Hall, 7-9:30PM. Details here. FEB 22: Western Michigan University, Biennial Diversity and Inclusion Conference, A talk and Conversation about More Together Than Alone, Room 4010, College of Health and Human Services, 1240 Oakland Drive, Kalamazoo, 9-10:15AM. Details here. MARCH 5: NYS Writers Institute, The Power of Community, Talk and Q&A, Page Hall, 135 Western Ave, Albany, NY, 7:30-9PM. Details here. MARCH 6: NYS Writers Institute, The Medicine of Poetry, Reading, Talk, and Q&A, Multi-Purpose Room, Campus Center West Addition, SUNY Albany 1400 Washington Ave, Albany, NY, 4:15PM. Details here. MARCH 8-10: Premayoga, Brooklyn, NYC, The Exquisite Risk: Daring to Live an Authentic Life, weekend workshop, Fri 7-9:30PM Sat 10:30-6:30PM, Sun 1-4PM, 498 Court St, Brooklyn, NY, 11231, 718-237-2372. Details here. APRIL 5-6: ABC Carpet & Home, Weekend Workshop, Finding What Can Last, Fri 6:30-8:30PM & Sat 10:30AM-6:30PM, 888 Broadway and 19th north of Union Square, New York City. Details here. APRIL 12-14: Manor Retreat Center, Weekend Retreat: The Gift of Deepening and The Radiance in All Things, register at Pine Manor, or contact Gail Warner at catchgw45@gmail.com, 949-552-1633. Details here. APRIL 25: More Together Than Alone, Reading and Conversation, Thurs 7-8:30PM, Wisdom Ways Center for Spirituality, St Catherine University, Carondelet Center, 1890 Randolph Ave, St Paul, MN. Details here. APRIL 26: More Together Than Alone: Service and Compassion, Workshop, Fri 9-12PM, Wisdom Ways Center for Spirituality, St Catherine University, Carondelet Center, 1890 Randolph Ave, St Paul, MN. Details here. MAY 17-19: Friday Night, Reading and Weekend Retreat (Sat and Sun), The Gift of Deepening and The Radiance in All Things, The Sophia Institute, Charleston, SC, or call 843-720-8528. Details here. JUNE 14-16: 1440 Multiversity, Scotts Valley, CA, Weekend Workshop: The Way Under the Way: The Place of True Meeting, Fri-Sun. Details here. AUG 7-11: Santa Sabina, San Rafael, CA, Five-Day Retreat, Heartwork: Being a Spirit in the World. Details here. AUG 8: Interview with Don George at Book Passage, Corte Madera, CA, Travel Writers & Photographers Conference, 7:30-9:30PM. Details here. AUG 23-25: Omega Institute, Rhinebeck, NY, Weekend Retreat, Drinking from the River of Light: The Life of Expression, register at OMEGA INSTITUTE. Details here. SEPT 13-15: Friday Night, Publication Reading and Weekend Retreat (Sat and Sun), Drinking from the River of Light: The Life of Expression, The Sophia Institute, Charleston, SC, or call 843-720-8528. DETAILS HERE. SEPT 26-29: Sounds True Foundation Event, 1440 Multiversity, Scotts Valley, CA, Keynote and Workshop. Details here. OCT 18-20: Copper Beech Institute for Mindfulness and Contemplative Practice, Hartford, CT, Drinking from the River of Light: The Life of Expression, Weekend Retreat. Details here. OCT 25-27: Harmony Hill Retreat Center, Drinking from the River of Light: The Life of Expression, Weekend Retreat, open to all, Union, WA. Details here. At the end of the book, Mark shares an essay about the nature and gift of journaling, followed by journaling guidelines, and 100 journal questions to work with. All to encourage the reader to engage in their own conversation with the Universe through the art of journaling. 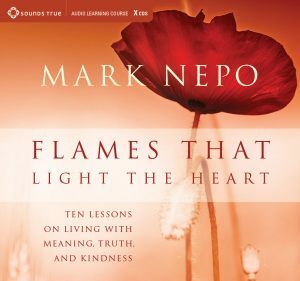 FLAMES THAT LIGHT THE HEART: TEN LESSONS ON LIVING WITH MEANING, TRUTH, AND KINDNESS. Flames That Light the Heart is an invitation to ten video sessions where Mark explore’s the passages that open us, as well as the skills and ways of being that help us meet the difficulties that life brings us. Using ancient and contemporary stories, poetry, journaling, and dialogue, Mark explores what it means to be transformed by what we go through and how to access the skills and inner resources for learning, growing, and healing. I’m humbled and excited that The One Life We’re Given was a finalist for the 2017 Books for a Better Life Award. 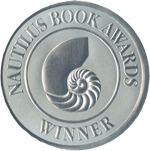 This is the fourth time I’ve been blessed to be a finalist: with The Book of Awakening in 2001, Inside the Miracle in 2016, and winning with Seven Thousand Ways to Listen in 2013. BBLA is such a fine group of giving people that this means all the more. Also, my good friend Elizabeth Lesser won with her moving memoir, Marrow. The wisdom presented on the shining pages of this holy book (The One Life We’re Given) is another luminous gift from a gallant, grateful and imaginative spiritual master. 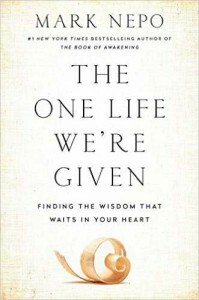 This new book affirms how precious this one life is and opens the chance we have to be fully alive and to be of use to each other and the world. Through personal stories of joy and grief, friendships and challenges, I try to illuminate how the life of the soul is shaped and crafted every day. I offer reflective questions and meditations to help make sense of our own experience and appreciate each moment. In truth, we learn to shape our perspective as a woodworker might carefully shave a piece of wood to reveal its inner grain. And throwing ourselves wholeheartedly into what we’re given brings us alive—whether we must deal with suffering, pain, fear, and loss, or surprise, beauty, love, and wonder. Each becomes an opportunity to listen more deeply to our feelings, to deepen our connection with others, and to sense the sacred nature of ordinary things. As we discover for ourselves the lessons of our journey, we are led to the wisdom that waits in our heart, the inner knowing of what truly sustains us—feeling, loving, and connecting—which allows us to fully live the one life we’re given. I confess that working with you as readers and students is a path I am devoted to. This path is a continuous inquiry into what it means to be human, to be here, and to care for each other. My hope is that you will deepen your conversation with life. That through your own path of obstacle and surprise, you will be opened to your gifts and become somewhat freed of all you carry. My hope is that this book will support you in becoming skilled at living with both effort and grace. This collection contains three separate books of poetry, gathering 217 poems retrieved and shaped over the past twenty years. The first two books in this collection, Suite for the Living and Inhabiting Wonder, bear witness to the messy and magnificent journey of being human. First published in 2004, they were wonderfully received and sold out of their first editions. Evolving these books further, Nepo has integrated fifty-eight new poems. The third book in this collection, The Way Under the Way, gathers eighty-three of his most recent poems. It centers on the place of true meeting that is always near, where we chance to discover our shared humanity and common thread of Spirit. 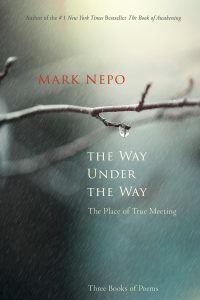 “When I read Mark Nepo’s luminous, meditative poems, one word stands tall in the mind and silence that follows—BEFRIEND. 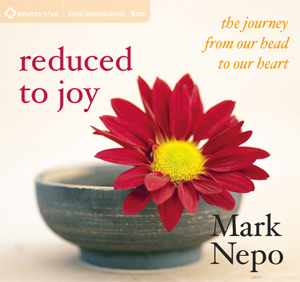 “In this magical book, Mark Nepo ushers us to the depth of who we are and where we truly live. In November 2013, Mark’s two-part interview with Oprah appeared on Super Soul Sunday on OWNTV. In these interviews with Oprah, Mark discussed the lifelong lessons from his cancer journey 26 years ago, and why he believes listening with a full heart is the key to living a vibrant and meaningful life. Mark explains how modern-day distractions can keep us from establishing deep connections with one another; he offers practical insights on how to cultivate our listening skills, deepening relationships with ourselves and others. Check out nine of Mark’s most moving quotes from his two-part interview with Oprah—and download them and share them with friends. CLIP: Why Mark believes listening with an open heart is the key to living a vibrant and meaningful life. On his way to Maui to meet Oprah, Mark wrote a poem about their meeting on an island with such an ancient and beautiful bamboo forest. Oprah and the Super Soul Sunday crew created this amazing video of the bamboo forest with Oprah reading Mark’s poem. Watch it here. Mark’s previous Super Soul Sunday appearance was on a panel with Ed Bacon and Elizabeth Lesser. WATCH SELECTED CLIPS HERE. MARK NEPO moved and inspired readers and seekers all over the world with his #1 New York Times bestseller The Book of Awakening. Beloved as a poet, teacher, and storyteller, Mark has been called “one of the finest spiritual guides of our time,” “a consummate storyteller,” and “an eloquent spiritual teacher.” His work is widely accessible and used by many and his books have been translated into more than twenty languages. A bestselling author, he has published twenty books and recorded fourteen audio projects. In 2015, he was given a Life-Achievement Award by AgeNation. And in 2016, he was named by Watkins: Mind Body Spirit as one of the 100 Most Spiritually Influential Living People, and was also chosen as one of OWN’s SuperSoul 100, a group of inspired leaders using their gifts and voices to elevate humanity. In 2017 Mark became a regular columnist for Spirituality & Health Magazine. 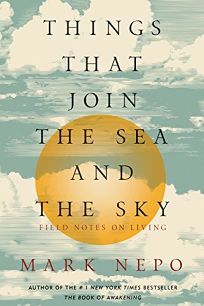 Recent work includes More Together Than Alone (Atria, 2018), Things That Join the Sea and the Sky (Sounds True, 2017), a Nautilus Book Award Winner and cited by Spirituality & Practice as one of the Best Spiritual Books of 2017, The Way Under the Way: The Place of True Meeting (Sounds True, 2016), a Nautilus Book Award Winner, The One Life We’re Given (Atria) cited by Spirituality & Practice as one of the Best Spiritual Books of 2016, Inside the Miracle (Sounds True), selected by Spirituality & Health Magazine as one of the top ten best books of 2015, The Endless Practice (Atria), cited by Spirituality & Practice as one of the Best Spiritual Books of 2014, his book of poems, Reduced to Joy (Viva Editions), named by Spirituality & Practice as one of the Best Spiritual Books of 2013, a 6CD box set of teaching conversations based on the poems in Reduced to Joy (Sounds True, 2014), and Seven Thousand Ways to Listen (Atria), which won the 2012 Books for a Better Life Award. Mark was part of Oprah Winfrey’s The Life You Want Tour in 2014 and has appeared several times with Oprah on her Super Soul Sunday program on OWN TV. He has also been interviewed by Robin Roberts on Good Morning America. The Exquisite Risk was listed by Spirituality & Practice as one of the Best Spiritual Books of 2005, calling it “one of the best books we’ve ever read on what it takes to live an authentic life.” Mark devotes his writing and teaching to the journey of inner transformation and the life of relationship. He continues to offer readings, lectures, and retreats. Please visit Mark as well at: www.marknepo.com and wmespeakers.com/speaker/mark-nepo.